This little frisky fox family is full of adorable antics, they stack together, dart in and out of the log, or cuddle inside. Stitch up a woodland scene that will spread smiles and spark imaginative play. Our Frisky Fox Whimsy Kit is twice the fun providing materials for both foxes and the reversible log. These kits are the perfect activity for sewing novices and pros alike. Whether you're a beginner or experienced stitcher, you'll enjoy the ease of working with embroidering felt. Our unique pattern designs are created with imagination, love, and care to create a multigenerational experience that will delight the whole family. Make the entire collection of Heidi Boyd Whimsy Kit creatures that can be passed down through generations. You supply the scissors and love! This little fox family is full of adorable antics, they stack together, dart in and out of the log, or cuddle inside. Stitch and stuff a woodland scene with his fun craft project that will spread smiles and spark imaginative play. 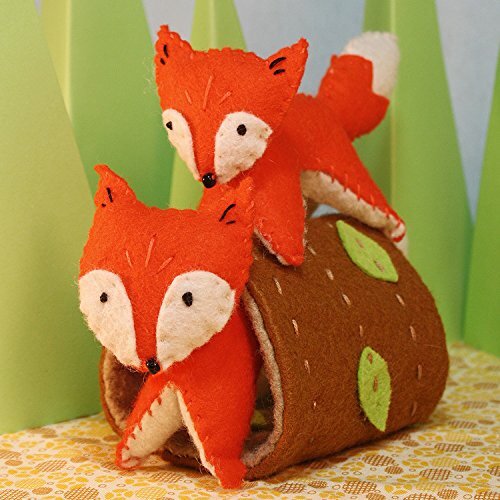 Our Frisky Fox Whimsy kit is twice the fun providing materials for both foxes and the reversible log. This kit is the perfect activity for beginning sewing and pros alike. Whether you're a beginner or experienced stitcher you'll enjoy the ease of working with embroidering felt. Our unique pattern designs are created with imagination, love and care resulting in an heirloom sewing project with a multigenerational experience that will delight the whole family. If you have any questions about this product by Boyd, Heidi, contact us by completing and submitting the form below. If you are looking for a specif part number, please include it with your message.